Yesterday I shared results for in-memory sysbench on a large server. Today I have more results from a similar test but with more contention. The tests yesterday used 8 tables with 1M rows/table. The test here uses 1 table with 8M rows. In some ways the results are similar to yesterday. But there are some interesting differences that I will explain in part 2 (another post). MyRocks does worse than InnoDB 5.6.35 at low and mid concurrency for all tests except update-index. It suffers more on the read-heavy tests. MyRocks and TokuDB are more competitive at mid and high concurrency than at low. MyRocks is faster than InnoDB 5.6.35 for many of the high concurrency tests. 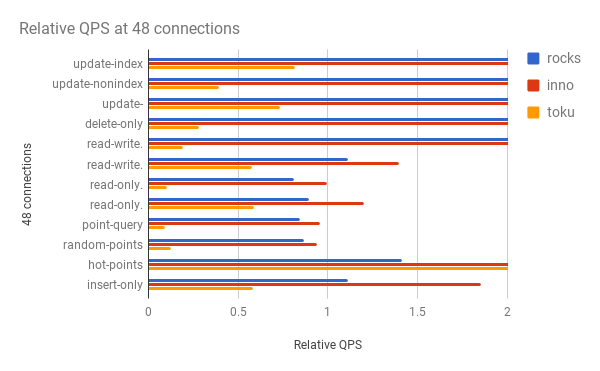 InnoDB QPS at low concurrency tends to decrease after 5.6 for tests heavy on point queries but something in MySQL 5.7 made InnoDB range scans much faster. All of the data is here. 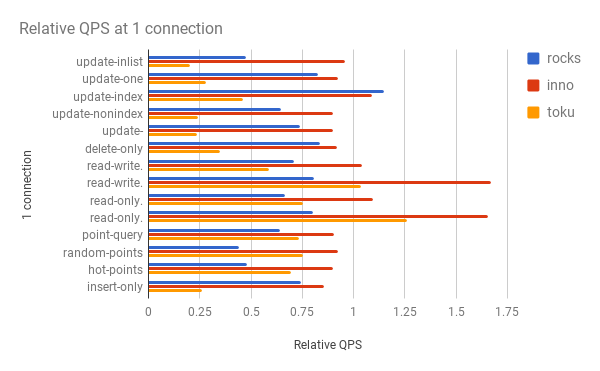 Below I share the QPS ratios to compare the QPS for one engine with the QPS from InnoDB from MySQL 5.6.35. The engine is slower than InnoDB 5.6.35 when the ratio is less than 1.0. Charts using the data from the previous section. For some of them I truncate the x-axis to make it easier to see differences between engines. 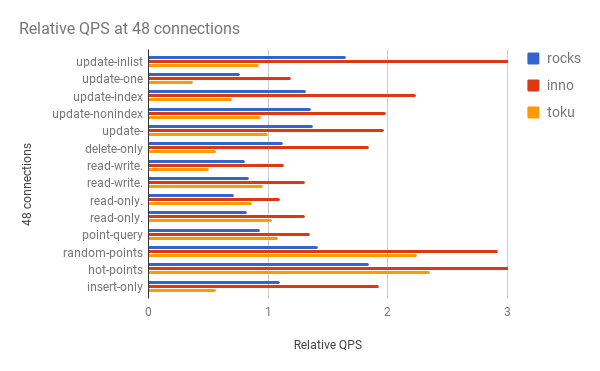 With advice from Igor I compiled MongoRocks from source for MongoDB 3.4. I previously shared how to do this for MongoDB 3.2. I did this to use a new version of RocksDB, 5.7.3 in this case, as the team continues to make RocksDB better. The instructions below are for Ubuntu 16.04. There are slightly different instructions here. Today I share worst-case performance results for MyRocks -- in-memory sysbench and a small database. I like MyRocks because it reduces space and write amplification, but I don't show results for that here. Besides, there isn't much demand for better compression from such a small database. This is part 1 with results from a large server. I use my sysbench fork and helper scripts, release specific my.cnf files and a server with 48 HW threads, fast SSD and 256gb of RAM. The binlog was enabled and sync-on-commit was disabled for the binlog and database log. I remembered to disable SSL. I tested MyRocks, TokuDB and InnoDB, with buffered IO and a 180g database cache for MyRocks/TokuDB and O_DIRECT and a 180gb buffer pool for InnoDB. The server is shared by the sysbench client and mysqld. For MyRocks I used a build from August 15 with git hash 0d76ae. For TokuDB I used Percona Server 5.7.17-12. For InnoDB I used upstream 5.6.35, 5.7.17 and 8.0.2. For InnoDB 8.0.2 I used latin1 charset and latin1_swedish_ci collation. Compression was not used for any engines. More details are in the release specific my.cnf files and I used the same my.cnf for InnoDB with 8.0.1 and 8.0.2. All mysqld use jemalloc. 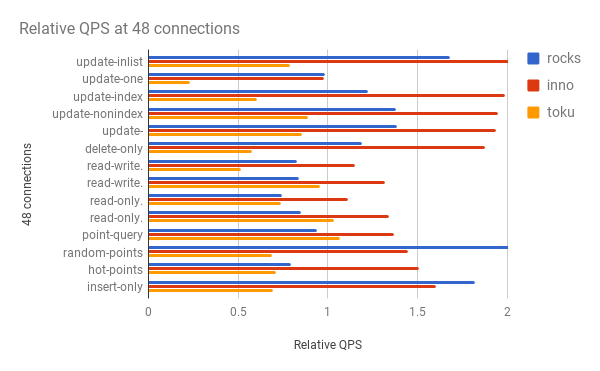 The charts below have the same data from the previous section - the QPS for the engine relative to the QPS for InnoDB from MySQL 5.6.35. 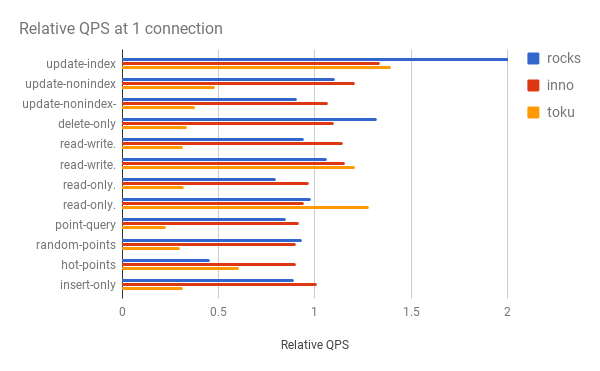 This is part 3 of my performance report on IO-bound sysbench. In part 1 and part 2 I used a large server with 48 HW threads. Here I use a core i5 NUC with 4 HW threads. I use my sysbench fork and helper scripts, release specific my.cnf files. The server is a core i5 NUC with 4 HW threads, 16gb of RAM and a fast SSD. The binlog was enabled and sync-on-commit was disabled for the binlog and database log. I remembered to disable SSL. I tested MyRocks and InnoDB, with buffered IO and a 4g block cache for MyRocks and O_DIRECT and a 12gb buffer pool for InnoDB. The server is shared by the sysbench client and mysqld. For MyRocks I used a build from August 15 with git hash 0d76ae. For InnoDB I used upstream 5.6.35, 5.7.17 and 8.0.2. For InnoDB 8.0.2 I used latin1 charset and latin1_swedish_ci collation. Compression was not used for InnoDB or MyRocks. Note that this description is correct where it disagrees with the my.cnf files that I shared. All of the data is here. The results here are mostly similar to the results from the large server however MyRocks does worse here on some of the read-heavy tests. The QPS ratio for point-query is 0.651 for MyRocks here versus 0.850 on the large server. 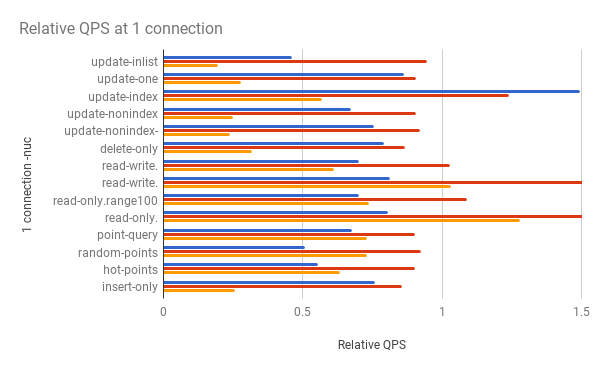 Note that the hot-points workload is not IO-bound, regardless we need to make MyRocks more effective on it. MySQL did something to make InnoDB range scans more efficient starting in 5.7. I don't know whether the problem for MyRocks is CPU or IO overhead in the range-scan heavy tests (read-write. *, read-only.*). Sorry, no charts this time. Charts from the previous post are close enough. This provide more data using the setup in my previous post. The difference is that the previous post used 8 tables with 100M rows/table and this post uses 1 table with 800M rows/table, so this test has more opportunity for contention. MyRocks does better here relative to other engines, so it suffers less from contention. InnoDB and TokuDB don't do as well on this test as on the previous test so they suffer more from contention. All of the data is here. The data below is the QPS ratio comparing the QPS for MyRocks, InnoDB 5.7.17 and TokuDB 5.7.17 with InnoDB 5.6.35. A value less than one means the QPS for the engine is less than for InnoDB 5.6.35. I have new performance results to share starting with modern sysbench, a large server, fast SSD and a database that is larger than RAM. Competitive read performance with much better space and write efficiency is why I like MyRocks and this is an example of that. However, we have work to do on read efficiency that will be apparent in future perf reports. For write-heavy workloads MyRocks competes with InnoDB 5.7 and 8.0 and does better than 5.6 at all concurrency levels. For read-heavy workloads MyRocks is usually within 10% of InnoDB 5.6. 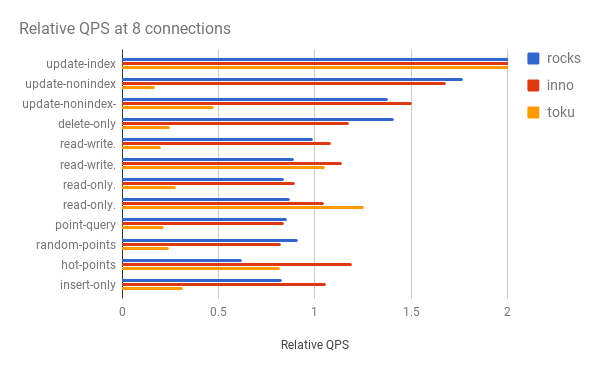 For write-heavy workloads InnoDB in 5.7 and 8.0 do better than 5.6. For some read-heavy workloads InnoDB has a perf regression from 5.6 to 5.7/8.0. I use my sysbench fork and helper scripts, release specific my.cnf files and a server with 48 HW threads, fast SSD and 256gb of RAM although only 50gb was available to the database and OS page cache. The binlog was enabled and sync-on-commit was disabled for the binlog and database log. I remembered to disable SSL. I tested MyRocks, TokuDB and InnoDB, with buffered IO and a 10g database cache for MyRocks/TokuDB and O_DIRECT and a 35gb buffer pool for InnoDB. The server is shared by the sysbench client and mysqld. For MyRocks I used a build from August 15 with git hash 0d76ae and repeated the test first without compression and then no compression for L0/L1/L2, LZ4 for interior levels and zstd for the max level of the leveled LSM. For TokuDB I used Percona Server 5.7.17-12 and repeated the test first without compression and then with zlib compression. For InnoDB I used upstream 5.6.35, 5.7.17 and 8.0.2. For InnoDB 8.0.2 I used latin1 charset and latin1_swedish_ci collation. Compression was not used for InnoDB. More details are in the release specific my.cnf files and I used the same my.cnf for InnoDB with 8.0.1 and 8.0.2. I have a lot of numbers to share and struggled with the presentation. All of the data is here. 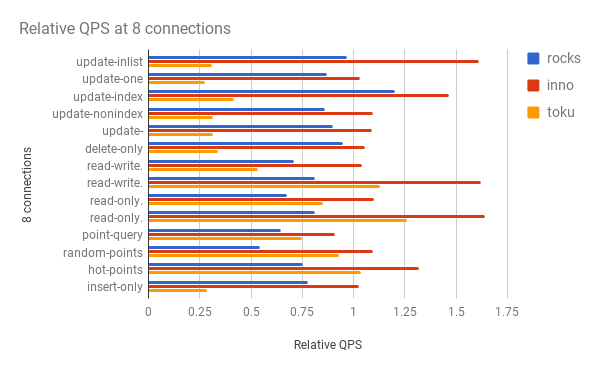 I will start with relative QPS - the QPS for an engine versus the QPS for InnoDB from upstream 5.6.35. There is one column for MyRocks without compression, one for TokuDB without compression and one for InnoDB from upstream 5.7.17. 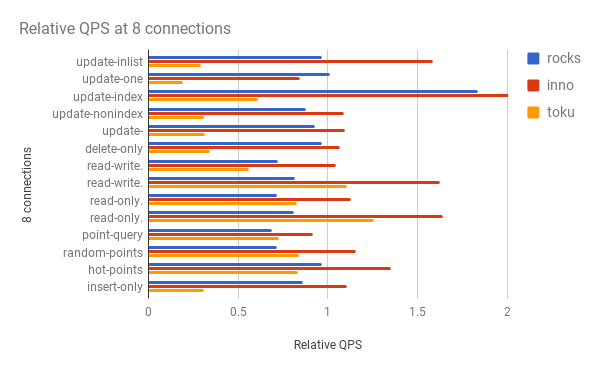 I did not include columns for compressed MyRocks, compressed TokuDB and InnoDB from upstream 8.0.2 to improve readability and because MyRocks/TokuDB QPS with compression is similar to it without compression and InnoDB QPS from 8.0.2 is similar to InnoDB from 5.7.17. Some people prefer graphs, so there is the relative QPS as a chart. I truncated the x-axis at 2 to make it easier see differences. The first chart is from the test with 1 connection. There have been several recent performance improvements to MyRocks that I want to test. The last build I did was from June 16. With the my.cnf options that I use there is one new option and 3 have been removed. The new option is rocksdb_max_background_jobs. The removed options are rocksdb_base_background_compactions, rocksdb_max_background_compactions and rocksdb_max_background_flushes.